Most of the glass used in England up to and including the early medieval period was probably made elsewhere and imported, although the glass was sometimes melted and shaped in workshops in England. However in the mid- and late-medieval periods, there is evidence of English glass production, for the first time making glass from the raw materials as well as shaping it into products. Two glass-producing areas are known: the Weald of Surrey and Sussex (Kenyon 1967), and Staffordshire (Pape 1934; Crossley 1967; Welch 1997). The Wealden glass industry was possibly the earlier and was probably the more important due to its proximity to London. The industry is likely to have originated in the 13th century and received a major stimulus in the late 16th century with the arrival of numerous French glassworkers. Some have suggested that the industry had gone into decline during the 16th century but this is disputed. A major study of the glassworking sites in Staffordshire (Linford & Welch 2004, Welch 1997) suggests a thriving industry spanning the 14th to 16th centuries; less is known about the dating of the Wealden sites, although a larger proportion appear to be 16th to early 17th century in date. The industry in both regions then collapsed in the early 17th century due to James I's 1615 prohibition on the use of wood as a fuel for glassmaking. A total of 48 Wealden Glass sites have been identified (Winbolt 1933; Kenyon 1967; Crossley 1994, plus one more in Clark 2006) in 12 Wealden parishes straddling the Surrey-Sussex border (fig 1), although some of the sites identified by Winbolt and earlier researchers have not been located by recent researchers. The origins of the project reported on here, supported by Historic England, lay in the recognition that, despite the fact that the industry was of national importance and there was a history of field survey and excavation stretching back almost a hundred years, there remained a number of major gaps in our knowledge. The most serious of these are the probability that many sites are unrecorded, the uncertainty surrounding the current condition and even exact location of many of the known sites, and the lack of knowledge of the technological development of the industry and its products through time. The project aims to address these uncertainties, so that well-informed decisions can be made with respect to managing and protecting the archaeological remains from this industry, which are increasingly affected by changes in land use. The fieldwork for the project began with a programme of survey, primarily geophysical but also including some topographic survey and field walking. There were some considerable successes. The detection of probable furnace remains at two sites, Hog Wood (no 15) and Lordings Farm (no 41) is of particular interest since both defied discovery by earlier researchers who expended a good deal of effort searching for them. The first, Hog Wood situated in difficult, boggy conditions which caused Winbolt and Kenyon to abandon their search, probably dates from the medieval phase of glassmaking. Lordings Farm is likely to have been worked by immigrants in the 'late' period of manufacture and is the glasshouse about which Kenyon said 'of all the remaining lost sites, this is the one I would like to examine most'. Furnace remains were located at a further seven sites. At Imbhams (no 8) the position of the furnace was particularly well identified (fig 2), there being a close correlation between high and clearly defined readings from the gradiometer, and surface finds of glass and crucible fragments. Malham Farm (no 28) and Glasshouse Lane (no 14) both produced several thermoremanent anomalies suggesting the possible presence of multiple furnaces. June Hill (no 44) was originally identified by Cooper in the nineteenth century as a possible glassmaking site (Ovenhouse Field or Hovel Copse): this was acknowledged by Winbolt but later dismissed by Kenyon. It is therefore pleasing that a large amount of glass finds came to light during the survey and demonstrates the need to keep 'possible' glasshouse sites under review. Geophysical surveys also revealed a number of features other than furnace structures which suggests that evidence of the wider glassworking complex survives in at least a number of instances and this is of some importance for the future management of these sites. Three small excavations, each of 4m by 4m, were undertaken to try and understand the how the survey results related to what lay below ground. At Glasshouse Lane no in situ furnace structure was encountered, but a heat reddened 'halo' of Weald clay, baked hard, indicates its former location and this material proved suitable for archaeomagnetic dating, giving a date of 1555-1650 (95% probability). The furnace was, presumably, made of brick and stone, as blocks of these with adhered glass found in a pit and ditch nearby indicate, and its demolition total. It is possible that much of the superstructure was reused elsewhere in the construction of another furnace as furnaces were only used for short periods of 5 or 6 years. The investigation into the glass furnace at Imbhams Farm (figs 3 and 4), in contrast, revealed substantial structural remains and a potential three phase use, yielding an archaeomagnetic date of 1515-1565 (at 95% confidence level) for its final firing. The furnace, in at least the first and second phases of its use, appears to have been constructed of local stone, utilising the local clay to line its base. It is unclear to which phase a nearby pit may belong, but it was all but certainly a raking pit. The area exposed by the trench at Lordings Farm did not reveal the furnace itself, despite the very promising signal obtained through the geophysical survey previously, due to a locational error in plotting. The amount of glass working debris generally, and especially within a ditch (whose purpose was unclear but likely to relate to the wider glassworking complex) clearly indicate that the furnace lay nearby. The finds other than those related to glass production are generally of limited importance, although a small collection of flintwork is of some intrinsic interest, especially the clear Mesolithic element, given the relative paucity of such material from Wealden areas (cf Cotton 2004, 24). The glass and related materials that were found are, however, of exceptional importance. 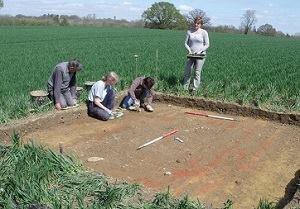 The EDXRF analysis of samples of glass from these sites suggests that Imbhams Farm is Early (ie forest glass of the type manufactured throughout the medieval period) while Lordings Farm and Glasshouse Lane are Late (ie the glass type brought to England by immigrant glassmakers in the 1560s). The archaeomagnetic dates for the final firing confirm this suggestion that Imbhams Farm is earlier than Glasshouse Lane. The material identified includes finished glass (fig 5) and diagnostic glassworking waste (figs 6 and 7). The glassworking waste includes several categories that have previously (eg Dungworth 2003) been identified as reliable indicators of the type of glass manufactured (eg threads, droplets, etc). The finished glass is highly fragmented but it can be divided with some confidence into flat glass (ie window glass) and hollow ware (blown vessels). The small number of rim sherds could derive from a large number of different vessel types, but need to be examined in more detail and compared against contemporary vessel types (Tyson 2000; Willmott 2002). During the assessment a number of pieces of folded glass were noted. These could represent vessels with a folded foot, such as beakers or flasks. The presence of small quantities of glass tubing could indicate the manufacture of alchemical vessels. Further scientific investigation has considerable potential to provide information on both crucible manufacture (cf Paynter 2012), the nature of glass-crucible reactions (cf Dungworth 2008), furnace manufacture, the fuel used and furnace temperature. The Imbhams Farm assemblage includes material from a stratified sequence which has potential to determine whether elements of glass manufacture changed over time. The investigations have provided a substantial body of new information about the Wealden glass industry and further work, especially on the glass and glassworking waste, will undoubtedly produce much more, which will be incorporated into the final publication. The work also has important implications for the management and potential designation of this archaeological resource and there will be further consideration of this as part of the project. This report has been prepared by Rob Poulton (Surrey County Archaeological Unit – SCAU) incorporating contributions by Tom Munnery (excavation director, SCAU), Archaeology South-East (geophysical survey), David Dungworth (glass and glassworking waste, Historic England – HE), Kayt Marter Brown and Nick Marples (other finds, SCAU), Paul Linford (archaeomagnetic dating, HE), and Zoe Edwards (geophysical survey, HE). The project was grant aided by HE and run by SCAU. The kind assistance of numerous landowners and farmers is gratefully acknowledged. Field survey, excavation and finds processing were all dependent on the contributions of a number of volunteers, who deserve particular thanks. Especial mention must be made of the assistance given to the project by Colin Clark, whose wise advice and direct involvement in all aspects of the work, freely sharing his immense knowledge of the Wealden glass industry, was fundamental to its success. Illustrations and references for the Wealden Glass Industry archaeological project. This PDF is co-owned with Historic England.